Cocktail Jelly Beans, thank you, I’ll have another! 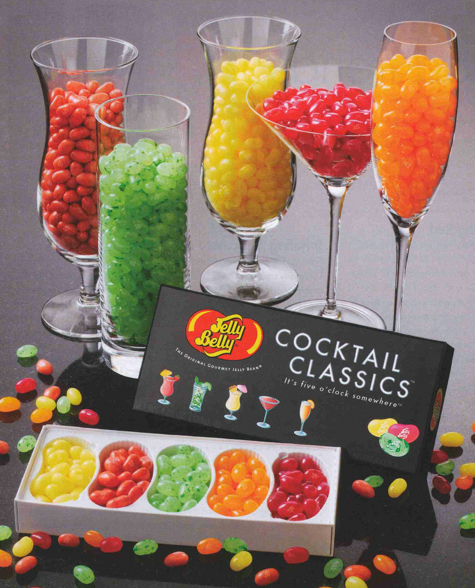 Jelly Belly has added “Cocktail Classics” to their flavor themes. The flavors are: Margarita, Peach Bellini, Pomegranate Cosmo, Pina Colada, Strawberry Daiquiri, and Mojito. My favorites are the Peach Bellini, and Pomegranate Cosmo, followed by the trusty Pina Colada. They only downside is no alcohol. I do believe that they’d sell buckets more if they were spiked. Am I right? My friend Rebecca brought these from Pennsylvania, I hope they sell them here in Idaho…of course, they might be considered a “gateway” candy, next step, Candy cigarettes…. Posted in chewy candy, Fruity. Bookmark the permalink. I’m partial to the Strawberry Daiquiri and Pina Colada (and getting caught in the rain) flavours, myself. By the way, I’m nominating you for One Lovely Blogger Award! Should you be inclined to accept, please copy & paste the award from my site and follow the rules described in my latest post. Yes, I’m sure that amazon or the Jelly Belly site has them. Thanks for reading! The Peach Bellini and Pomegranate Cosmo would probably be my favorites too! Sounds like I’ll have to find some! A gateway candy…. :-) You could blow the sugar powder out of the candy cigarettes and it really looked like a Dunhill! So sophisticated! Remember licorice pipes and the candy cigars – that strange pastel colored gum that was oddly runny. And the candy drinks in the little wax bottles? Things that only children will eat, like Spaghetti-O’s and fish sticks – and as you already mentioned on your blog the mystery of the Pixie Stix and Lic-a-Stix. Thanks for visiting, your contest sounds great!